View presentations made at business and community events, and conferences. 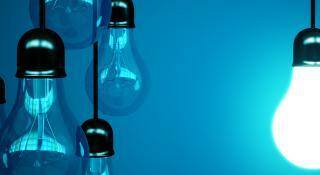 Presentations from the HRF Centre's functions are listed under the Events tab. 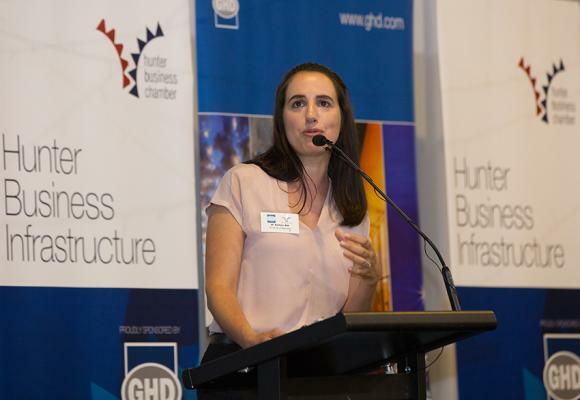 Dr Anthea Bill, HRF Centre lead economist, gave a presentation on the value of the John Hunter Hospital campus, and the health sector, to the Hunter regional economy at the Hunter Business Chamber's Hunter Business Infrastructure luncheon on 22 February. 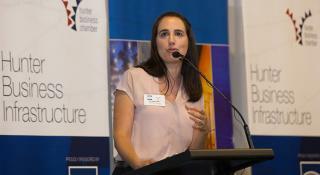 The luncheon also featured the NSW Minister for Health,the Hon. Brad Hazzard, who spoke on plans, policy and regional projects relevant to the health portfolio. This included the latest information on the new Maitland Hospital and proposed John Hunter Hospital redevelopment. Presentation by Dr Anthea Bill, HRF Lead Economist, at a workshop hosted by the NSW Minister for Health, Brad Hazzard, to discuss the future redevelopment opportunities for the John Hunter Health Precinct. HRF Centre Director, Professor Will Rifkin, addressed the June meeting of the Newcastle Institute as part of a panel discussion around creating sustainable and resilient communities and local urban planning.